Coming in as a little surprise bonus to Deus Ex: Mankind Divided, Breach is a free add-on mode that will come with all copies of the main game when that’s out in August. Breach plays a lot like the main game, but takes place inside a virtual reality, in which a hacker, who’s just joined a cyber terror group, attempts to invade the network of one of the biggest banks in the Deus Ex world, the Palisade Corporation. As a quick drop in, drop out game, Breach works wonderfully. 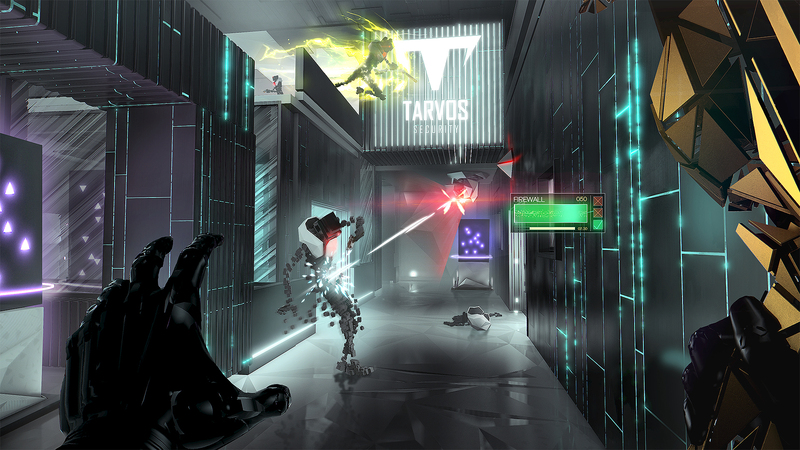 It’s pretty much a Portal-like puzzle game that just happens to play under the conventions of Deus Ex — that is, stealth and avoiding detection — play a big part in how you finish its short levels. Enemy units sometimes patrol your path towards the valuable data that you steal, and you can knock them out in the same fashion as in actual Deus Ex, for as strange as non-lethally eliminating virtual people within an already fictional game might sound. The main objective in the game is to steal data from mainframes scattered around levels, and them making your way back to the entrance. There’s usually a certain number of nodes you absolutely have to hit on your way through, leaving a few around for bonus points. The levels themselves are very quick to get through and you’re timed, so you can expect to find a certain amount of replayability via speed runs. I didn’t run into a lot of stages with complex designs, but it was fun to see the team at Eidos Montreal play with verticality in later levels, mainly to show you that you can really use almost all of the powers from the proper game, including the ability to jump really high up, the ground pound and seeing through walls. Given that this is a Deus Ex product, you’ll also run into other characters along the way. The one I met during my time with the show floor demo was your handler, who likes to chat via text with the protagonist from time to time. The responses were very limited in the demo, giving you only a couple of choices that were very tenuously balanced between being a straight up hacker jerk or a hacker jerk with a more amicable personality. It’s all very stylized and flashy, so jury’s still out whether or not any of these moments will be at all relate. The demo was quick to move out of these dialogues and put you in the action, but you can expect a bit of character development interspersed between stages. Speaking of stages, the way you unlock them, more specifically, is done the same way you do in the main game, by taking over nodes over a server map and spending points, which is yet another nod to the main game, if this add-on needed any more. Another element that ties Breach to Mankind Divided, better yet, the entirety of Deus Ex, is its presentation, which is sleek and very reminiscent of the visual queues of the newer entries in the franchise. While not as impressive looking as them, Breach has a flavor that fits in well, albeit much simpler and contained, which in my book is A-OK. Given that this is a free mode that will come with Deus Ex: Mankind Divided, there would be no way of recommending not buying it, unless you are not interested in Deus Ex as a whole. All things considered, Breach is a cool distraction that seems to work pretty well as a companion to the main game. It contains just enough similarities that make it feel like part of Deus Ex, as well as new things that set it apart just enough for it to be its own thing. We’ll know more in August, along with Mankind Divided.